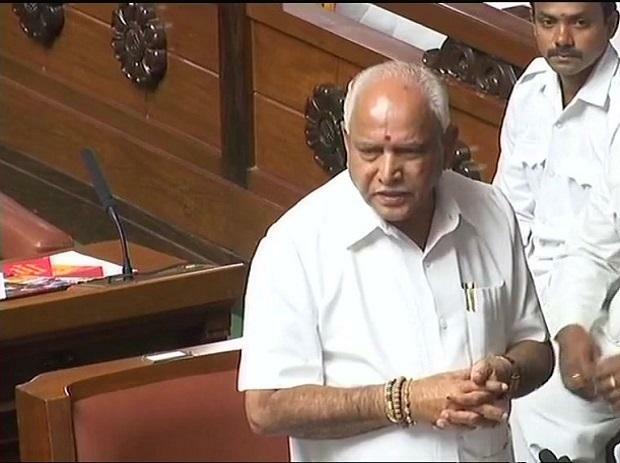 Karnataka BJP president B S Yeddyurappa has said some Congress MLAs skipping the Congress Legislature Party (CLP) meeting and the deep differences between the ruling coalition partners are an indication that a volcano may erupt in the coming days. His remarks came after four dissident Congress MLAs on Friday skipped the CLP meeting here that was called as a show of strength against an alleged bid by the BJP to dislodge the H D Kumaraswamy-led Congress-Janata Dal (Secular) government. "The absence of Congress MLAs from the CLP meeting and deep differences between the coalition partners are an indication that this is likely to erupt as a volcano in the next coming days," Yeddyurappa said late Friday evening here. Their absence also shows intense and widespread anger and resentment among Congress MLAs, he said. The BJP chief said the tone of CLP leader Siddaramaiah's warning to the party MLAs showed his frustration and fear. "Mr Siddaramaiah, the tone, tenor and content of the meeting notice given by you to the MLAs shows your frustration and proves that you are gripped by fear. If your relationship with the MLAs was strong and cordial, why did you mention in the notice that action would be taken as per the anti-defection law?" Yeddyurappa asked. The Congress would issue notices to absentee MLAs -- Ramesh Jarkiholi, B Nagendra, Umesh Jadhav and Mahesh Kumatahalli, Siddaramaiah had told reporters after Friday's meeting. Yeddyurappa also attacked Congress general secretary K C Venugopal over his remarks that 'Operation Lotus' commenced in Karnataka in 2008. The BJP chief said it was the Congress which started the "aaya ram, gaya ram" culture, referring to the practice of MLAs defecting to other parties, he said. "In 1967, the then prime minister Indira Gandhi had said that 'gaya ram has now become aaya ram' when an MLA of her United Front government had joined and quit the Congress three times in a gap of 15 days," he said. The former chief minister said it would be better if Siddaramaiah and Venugopal study political history to know what happened in Haryana where the Congress had formed the government with Bhajan Lal with the help of 36 Janata Party MLAs. The Congress is continuing this culture, Yeddyurappa said. It looks like that Siddaramaiah has forgotten that he too joined the Congress with the same culture, he added. Yeddyurappa said the BJP was not lusting for power. With 104 seats, the BJP is functioning as a vigilant and constructive opposition party and the Congress and the JD(S) with 80 and 37 seats, respectively, have formed an unholy alliance to form the government, he said. Kumaraswamy and Siddaramaiah should realise that this is first time in the history of legislature that a party with more than 100 seats is sitting in the opposition. Yeddyurappa also said that the BJP's MLAs assembled at a Gurgaon hotel to discuss the strategy to win the upcoming Lok Sabha elections. "If 104 MLAs of our party meet at one place and discuss the strategy to win the Lok Sabha, what is your problem? It is your responsibility to keep your party MLAs under control. If you scream the way you have been doing, it only shows your helplessness," he said. Taking a dig at Venugopal's remarks that "glorious days" of the grand old party must return, Yeddyurappa asked if he was referring to the return of "multi-crore scams of the Congress-led UPA regime". He accused the Congress and the JD(S) of fooling people and said while the two parties were friends in Karnataka, they were enemies in Kolkata. "As usual the JD(S) has been playing a double-game. The JD(S) needs the Congress on one hand and on the other, the JD(S) wants 'mahagathbandhan', which the Congress does not want," Yeddyurappa claimed. The double standards of these parties show that there is no alternate to Prime Minister Narendra Modi, he said.